Email Automation is the first step to Office Automation and just one of the many features built in WinAutomation. Automate your inbox and never miss out on an e-mail, or retreive e-mails based on your criteria. Managing your inbox is one of the most challenging areas in today’s work day. Often so cumbersome and bulky, that it has come to the point of being a part-time job, if you were to actually go through all the e-mails that you receive. WinAutomation and its built-in Email Automation Actions are here to help with even more sophisticated Email Automation, like email data extraction and inbox monitoring for triggering events. 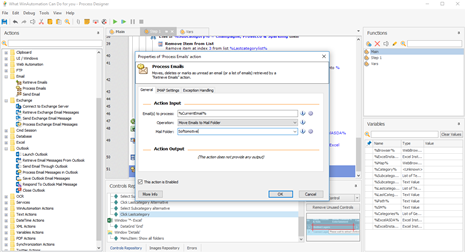 WinAutomation can Send, Receive, Process, e-mail through SMTP/IMAP, Exchange Server protocols. It is also integrated with Microsoft Outlook for manipulating any e-mail in your Outlook account. 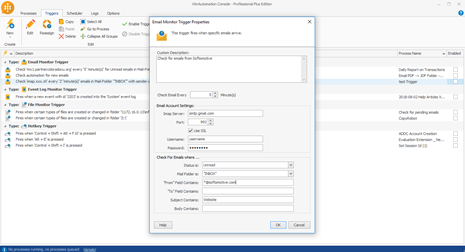 Send emails to stakeholders with data produced from running automations. Or, inform contacts via e-mail upon the successful/unsuccessful completion of a process, or within the processes logic for sharing significant information. Customize your e-mail body with html, through one simple WinAutomation action, include metrics, images, or other info gathered through the process execution real time and let your automation do the job for you. Retrieve emails from any of your account folders, that meet specific criteria and loop through them in order to take certain actions for each one, depending on the subject, body, sender etc. 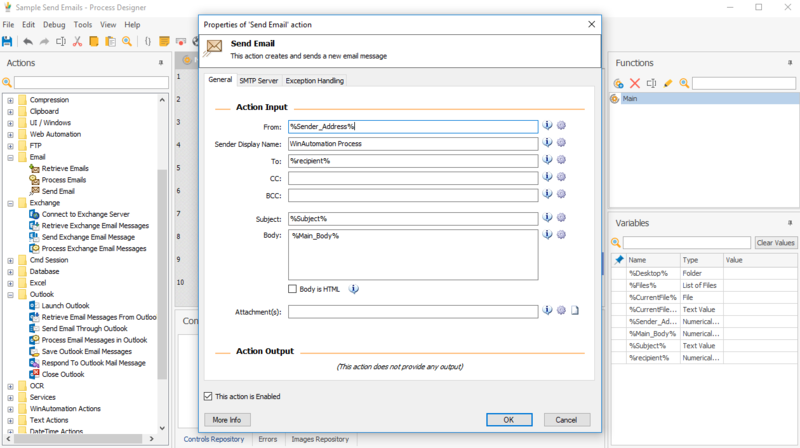 Set up processing rules for your inbox to move, delete, mark e-mails as read/unread, save attachments or process them before forwarding or replying. Let WinAutomation put your workstation on autopilot. Give it to be own assistant, who clears up and manage your most important and critical email correspondence without even clicking a button! 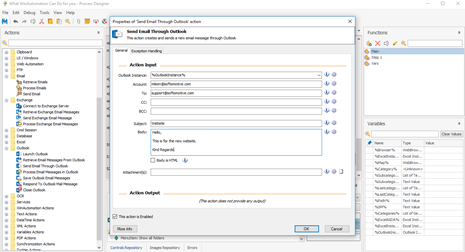 Set the appropriate Actions that will fire off, when a certain e-mail arrives, like when a typical support ticket has been received, or when a Purchase Order has arrived, or when a document has been created for processing or when a deadline is about to expire.